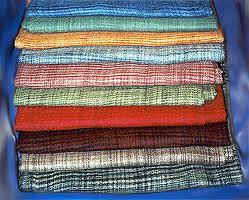 Khadi is Indian handspun and hand-woven cloth. The raw material, cotton, is spun into threads on a spinning wheel called a charkha. The spinning of khadi was Mahatma Gandhi's main means of providing self-employment to the rural populace of India. He also wanted to spread the message of not using foreign clothes. The freedom struggle revolved around the use of khadi fabrics and the dumping of foreign-made clothes. and to this day most politicians in India are seen only in khadi clothing. and you may expect a 3% shrinkage in the first wash.